Really, the title sells this recipe. 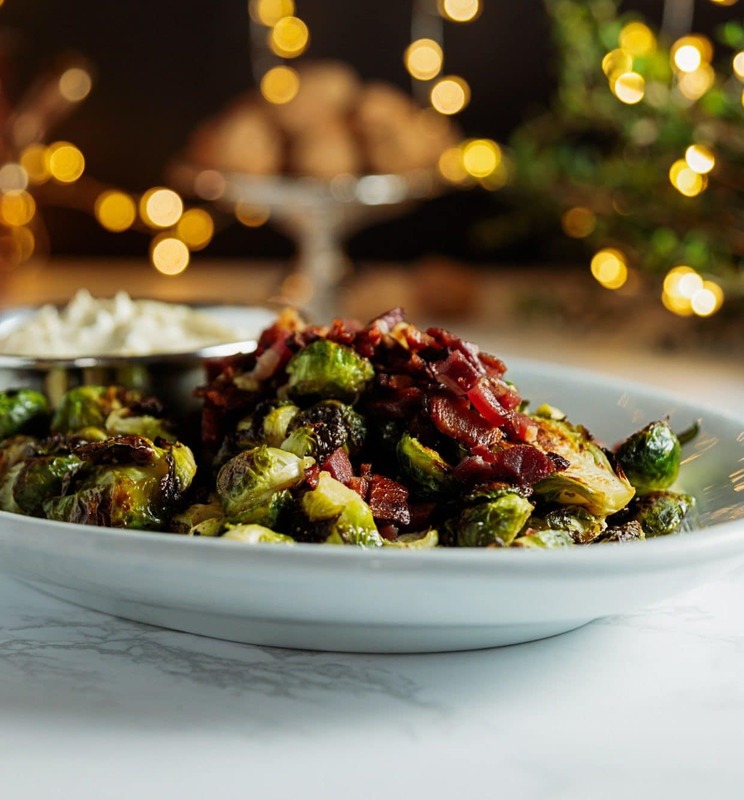 Whether you want a fun appetizer before dinner, a great snack durning a party or just a delicious for-yourself-dish, these Brussels get me every time. First roasted in the oven to make them slightly tender, then fried in a little bacon grease for a smoky crispy finish, these really are a holiday indulgence. 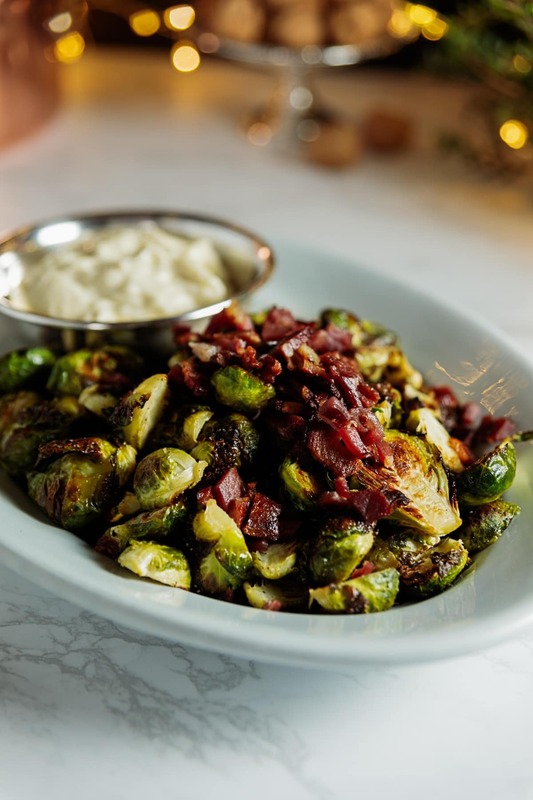 Served up with the easiest garlic aioli – honestly it’s mayonnaise with some garlic – and crumbled bacon, your Christmas just got a whole lot more merry! Trim the stem of each Brussels sprout and cut in half iff larger than 1/2 inch diameter. Drizzle trimmed and cut sprouts with oil and sprinkle with salt and pepper. Toss to coat and pour onto baking sheet in an even layer. Roast in preheated oven until tender crisp, 12-15 minutes. A knife inserted will meet a little resistance. Remove from oven. While roasting, cook bacon in a large skillet over medium-high heat. Transfer cooked bacon to a towel-lined pan. When all bacon is cooked, leave bacon grease in skillet and remove from heat if the Brussels have not finished roasting. Transfer half of the roasted brussel sprouts to the hot skillet. Fry the sprouts until crispy and browned, 3-5 minutes. Transfer to a towel-lined tray and continue frying the second batch of sprouts. If skillet seems dry, add 2 tablespoons of a neutral oil. Finish frying sprouts and transfer to a serving plate. In a large measuring glass, combine the egg, mustard, lemon zest, lemon juice, salt, pepper and garlic cloves. Using an immersion blender, food processor or standard blender, blend the ingredients until combined. With blender running, slowly pour in oil until consistency is thick and white, 1-2 minutes. Taste for seasonings and set aside in refrigerator until ready to use. Need I even say Merry Christmas?